Bushmills, Co. Antrim 16th September 2016: Bushmills Irish Whiskey today marks a momentous occasion in the 400 years of whiskey making history in the area, as apprentice Chris Kane becomes the first person from the Island of Ireland to graduate as a Cooper in more than 30 years. 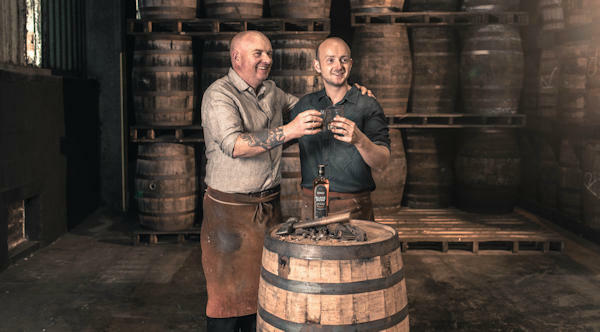 Chris, who hails from the village of Bushmills itself, is the fourth generation of his family to cooper casks at the Old Bushmills Distillery, totalling 140 years of family service. His great grandfather, Jimmy Kane, started coopering in 1935, followed by his grandfather, Johnny Kane, in 1951. Chris himself began coopering at home with his father, Alastair, at the age of nine and today he and his father keep this tradition alive as they work side-by-side in the Old Bushmills Distillery Cooperage. It takes five years to learn the highly skilled trade of coopering. Testament to his talent and determination, Chris took only four years to master the skills, using the same tools that his great grandfather wielded over 80 years ago.